Federal court involvement in Orange County’s homelessness crisis is ramping back up, with Judge David O. Carter setting a Friday morning hearing in response to the closure of armory shelters, which pushed more than 200 homeless people into local communities where it’s illegal to camp in public. The hearing comes after homeless people who had been staying at the county’s two National Guard armory shelters lost that option in mid-July – when the armories closed until winter – and returned to the streets. The county’s other shelters have already been at or over their reasonable capacity, according to Carter. The judge previously told city and county officials that people staying at the armories need to be accommodated when the existing facilities closed. “Those are people actually seeking help,” Carter said in May, referring to homeless people staying at the armories. “They don’t want to be sleeping” in people’s backyards, “and you need to accommodate them,” he told city and county officials. But the closure came and went without additional shelter beds coming online, nor any commitment from local officials for when a similar shelter capacity would become available. “Hundreds of people are, once again, without a place to sleep at night other than on the streets, in the parks and in other public places, where they are experiencing harassment and arrest by law enforcement,” attorneys for homeless people wrote last week in an update to their lawsuit. Up to 242 people stayed at the two armory shelters each night in the weeks before they closed. One armory is in Santa Ana and the other is in Fullerton. City officials in Santa Ana, which has more homeless people than any other OC city, have said the armory closings, and the earlier eviction of hundreds of homeless from the Santa Ana riverbed and Civic Center, has inundated their neighborhoods and businesses. In their updated suit, attorneys Carol Sobel and Brooke Weitzman alleged constitutional violations and renewed their request for a court order banning the cities of Anaheim, Orange, and Costa Mesa from enforcing anti-camping laws against homeless people – at least until shelter options are available so people have a viable option to not break the camping laws. “By virtue of their status as homeless and disabled, and the absence and insufficiency of shelter or housing in the region…[homeless people] have no way to comply with the laws [cities] have sought and continue to seek to enforce against them,” states the updated complaint. Two days after the July 26 lawsuit update, Carter scheduled a hearing for Friday morning. Carter also hinted at his prior suggestions that he’s willing to let local governments out of the lawsuit through settlements if they act to provide sufficient shelter. “The Court is prepared to present proposed settlement terms, after hearing from the parties,” he wrote. 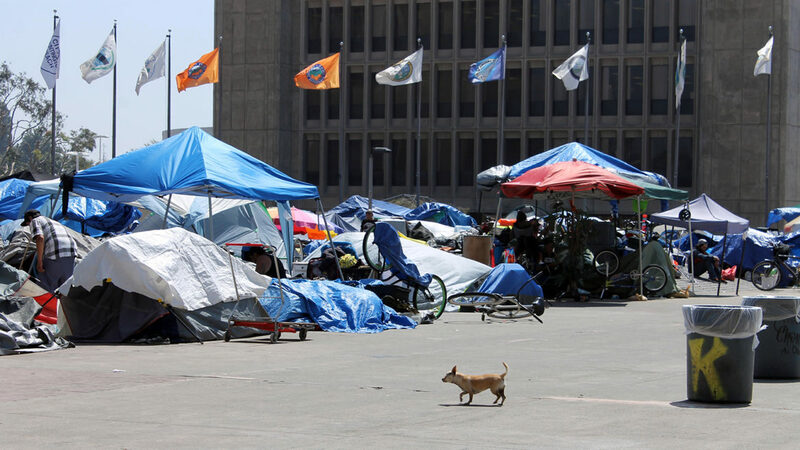 Anaheim, Orange, and Costa Mesa have been the defendant cities in the lawsuit from the time it was filed in January, when the suit centered on the impending eviction of a large homeless camp along the Santa Ana riverbed that ran along the border of Anaheim and Orange. At one point Santa Ana moved to add all of Orange County’s 34 cities to the suit, Orange County Catholic Worker v. County of Orange. But the city abruptly stopped serving the paperwork, and the other cities are not officially part of the lawsuit at this point. Carter, however, has suggested he could ultimately decide whether to ban on anti-camping ordinances countywide or divide it into different regions, if the attorneys for homeless people request it. In their lawsuit update last week, Weitzman and Sobel laid out a series of alleged constitutional violations and asked for 14 categories of court orders against the county and the three cities currently in the suit. -Ban the county and three cities from issuing any development permits until they comply with the homeless shelter zoning law known as SB 2, which requires cities and counties to designate areas where shelters can be built “by-right” without needing discretionary approvals from the city. Sobel and Weitzman estimate more than 1,500 people would fall under the class. “The county has an interest in building out a system of care. And the county and the Board [of Supervisors] would very much like to do so, with the assurance that once it makes a commitment, that it won’t then be sued again and again in subsequent successive lawsuits,” he added. Carter has called on cities, including in south Orange County, to set up emergency shelters, or “intake” centers, to provide options for homeless people who want to get off the streets, and to make anti-camping enforcement a legal option for law enforcement as an incentive for homeless people to seek services. “The component that Judge Carter is most concerned about has to do with law enforcement, which is – if, say health workers or the police runs across someone who’s homeless, and they need help and they need a place to stay – where can they take those people? Like, that day,” said county supervisors’ Chairman Andrew Do, in an interview with Voice of OC in late June, two weeks after the most recent court meeting. “So that’s why, when we’re talking about emergency shelters…it has to be someplace that’s accessible” to health workers and law enforcement, he said. That’s why the judge “doesn’t want anything that’s longer than a half hour commute from any of the cities in south county,” which would be “centrally located in south county,” Do said. One of the sticking points in the shelter discussions has been who will pay for it. City officials have looked to the county to pay most, if not all, of the costs for new shelters. And the county has been accused of rebuffing requests that it chip in for a proposed shelter, either by not responding to city officials or asserting the county has no available funds for it. Last week, an Orange County businessman presented “an extremely viable plan” for a shelter with “life-rebuilding” assistance, said Jeanine Robbins, an Anaheim resident who advocates for homeless people, during public comments at Tuesday’s county Board of Supervisors meeting. “[County CEO] Frank Kim’s response to this incredible project? ‘There is no money.’ ‘There is no money,’ ” Robbins said. Regarding a potential 700-bed shelter in Santa Ana, which county and city officials referenced in federal court last month, Voice of OC asked about the accuracy of claims Santa Ana requested financial assistance from the county but the county did not indicate to the city it will chip in financially. The county reportedly either did not respond to the city or indicated funding is not available. “Negotiations with various city partners are still ongoing at this time,” Nichelson replied. The county’s top attorney said funding was available. “The challenge, as we often find, is that the county does not have local land use authority. So we really need cities to step up” in identifying sites for additional shelter, Page said. Friday’s hearing comes after a weeks-long lull in the official court proceedings, which had a series of court meetings in the spring but had been quiet since mid-June. However, Carter apparently continued to monitor the situation. “The court has remained in close contact with county officials, and is well aware of ongoing discussions that county officials are having with other local elected officials,” said Page. “My sense is the court is very much aware of [what] the county is involved with and very much supports what the county is attempting to accomplish,” he added. Page said his impression is the court is most interested in hearing from the cities that don’t seem to be as active in building a system of care for homeless people. “I imagine that the court would use [Friday’s hearing] to encourage other cities in the county to step up their efforts to provide shelter to homeless persons,” Page said. “That will then leave regions that are unable to meet their obligation – they will be kind of an outlier,” Do said in the late-June interview.